5/3: TruckShuka Detroit Israeli food truck at the taproom from 6:30-9:30 p.m.
5/4: Episode 13- 3 Year Reserve bottle release starts at 2 p.m. and Senor’s Food Truck (Amazing Mexican cuisine!) arrives at 6 p.m.
It’s KARAOKE time and we got the best songs picked out. Bring your appetite and your singing voice. Doors at 5 p.m.
5/11: Chocolate Coffee Sanchez (Raspberry Mead with cacao nibs and Chazzano coffee!) 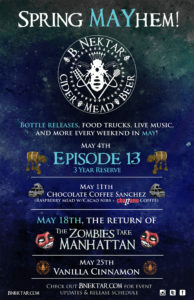 bottle release starts at 2 p.m. Live Music by AfterOurs (8 p.m.) and food by Detroit Panzerotti Company food truck at 8 p.m.
5/16: Simply Spanish food truck Serving up the goods from 6-9 p.m.
5/18: The Zombies Take Manhattan (Barrel-aged Imperial Zombie Killer) Returns! 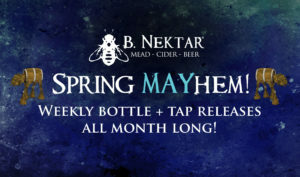 Bottle sales begin at 2 p.m. The Third Wall (classic cult-films and music, feat. Eddie Logix) starts at 8 p.m. More fun TBA!!! 5/22: Rush Hour Recital: Skip the rush hour commute and enjoy a concert instead! Experience an intimate performance by DSO musicians at the B. Nektar taproom —no ticket or reservation required! These events are still being updated, so check back here or Facebook for updates!